It is important to understand the relationship between patent claim limitations and the strength of a patent. The patent claims are perhaps the most important part of the patent because they define the scope of patent coverage the patent holder will be entitled to. Stronger patent claims mean a stronger patent. In general, the more elements or limitations that are included in a patent claim, the weaker that patent claim becomes. For example, a patent claim for a bicycle that has two wheels, a frame, and handlebars is stronger than a patent claim for a bicycle that has two wheels, a frame, handlebars, gears, and brakes. Note the second claim has more limitations so it is easier for a competitor to work around and thus it is not as strong as the first claim. Unfortunately, stronger patent claims are often the most difficult and expensive to get allowed by the patent office. By adding elements or limitations into your claims, you can increase the probability that your patent will be allowed. In summary, the more claim elements you have in your first claim, the easier it is to get allowed but it may make for a weaker patent. CLAIM 2 - References claim 1 so it is understood to have all the features of claim 1 but also includes a new feature. CLAIM 3 - References claim 2 - has all the features of claim 2 and claim 1 plus adds a new feature. CLAIM 4 - References claim 1 so has only the features of claim 1 but may add a new feature. A bike with a wheel and handlebar. The bike of claim 1, with a gear shift. The bike of claim 2, with a brake system. The bike of claim 1, with a brake system. Note: claims 3 and 4 may seem the same but claim 3 must include a bike, a wheel, a handlebar, a gear shift, and a brake system. Claim 4 does not require a gear shift because it is never linked to claim 2 and instead is only linked to claim 1. 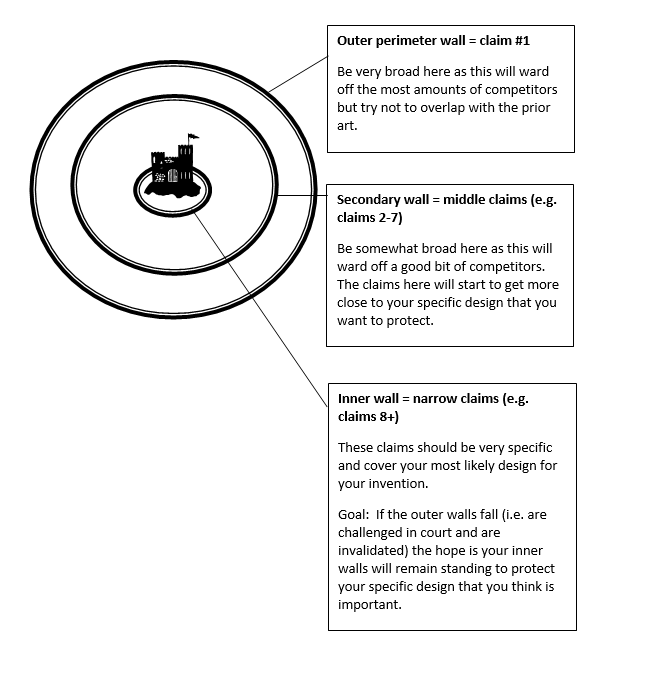 One way to think about the grouping of claims is to picture them as protective perimeter walls around a castle. Your castle is your invention you are trying to protect. « Extend or Renew Provisional Patent Application (PPA)	» Squeeze multiple inventions into a single patent?